Doctor Who: SUPREMACY OF THE CYBERMEN #2 Review | Warped Factor - Words in the Key of Geek. Nice storyline, shame about the faces, says Tony. When you’re tasked to write Titan Comics’ multi-Doctor ‘event comic’ of the year, you’ve got to turn your imaginations up to 11 – or indeed, 12 in this case. When you happen to be George Mann and Cavan Scott, that’s a properly Tardis-sized shedload of invention. As you might guess from the title, the subject of Mann and Scott’s comic-book treatise of the year is that the Cybermen finally win. 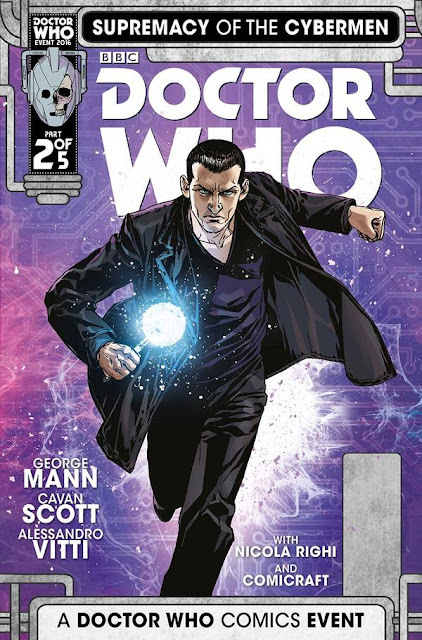 From a single premise like that springs much in the way of fan-squeeing material – at the end of issue #1, we were looking at prehistoric Cyber-Silurians with the Eleventh Doctor and Alice, dealing with a squadron of desperate Sontarans with the Tenth Doctor, Gabby and Cindy, chasing a new form of Cybercreature round London with the Ninth Doctor, Rose, Jack – and Jackie Tyler(! ), and in the company of the Twelfth Doctor we were… well, let’s just say advancing on the events of Hell Bent. Yes, really – we’re in brand new Who territory with He of the Attack Eyebrows. It all makes a perverse sort of sense once you know that last bit, because as has been noted by characters throughout the history of the show, the Doctor has a habit of flying off, leaving loose ends to sort themselves out as though they have to, as though the universe is under some kind of moral imperative to do the right thing, the good thing, once it’s been treated to his example. The universe has a tendency – especially recently – to disagree. But that’s quite the handful of Who to steer through five issues, every element of which has lots to recommend it to Who-fans. This issue moves the story on quite a lot in terms of Doctors Ten and Twelve, while allowing the Ninth Doctor a bit of action hero time, and the Eleventh to Mostly Faff About Avoiding Dinosaurs. As you do. It’s really the Twelfth Doctor that pushes the story dramatically forward here, bantering with a figure from his past, who’s been appointed as a shiny new Cyber-Planner after their last run-in with our favourite renegade. They’ve turned the might of the Cyber-army on their own people, because clearly they haven’t watched any Doctor Who, ever, and so think the Cybermen are their servants. That rather sets up an expectation in our mind of a turning point later in the run, where it’s pointed out to them with some force that watching some Doctor Who would really have been a good idea before doing deals with the emotionless tin soldiers of Mondas. Telos. Ah hell, who knows any more. Still, the Twelfth Doctor’s confrontation with his old enemy here leaves us feeling like we know enough about the backstory to the first issue’s several ‘what the hell?’ moments. We understand how all the crisis points of issue #1 could have arisen, at least in a vague ‘oh, that explains everything’ sort of way. In essence, this issue gives us a straight line, logical path by which the Cybermen could become universally victorious, universally supreme. What’s more, it’s a pathway that feels familiar to fans of Classic Cyber-stories like Revenge and Attack, so we accept it as a logical way for the Cybermen to behave. So far then, so fabulous. The Tenth Doctor’s story-arc in this issue is actually more interesting than any of the others though. Stranded at the mercy of the Sontarans in a universe where the Cybermen have become an unstoppable, implacable, indefatigable enemy, the Tenth Doctor encounters things he never expected to encounter, and finds himself in an unenviable position by the end of the issue. There’s some fantastically solid writing here in two traditions – the tradition of Robert Holmes to ‘just make this stuff up and make it sound good’ and the tradition of the Tenth Doctor to throw names and events into conversation as though he’s using them to impress a date. While all meaning very little, it tickles most fans where they live, sparking our imaginations of things unseen and now, things gone. It’s exactly the kind of blether you want in a celebratory comic-book (or indeed a celebratory episode), and we do at least get an introduction to one real new development that takes our understanding of the Sontarans forward. 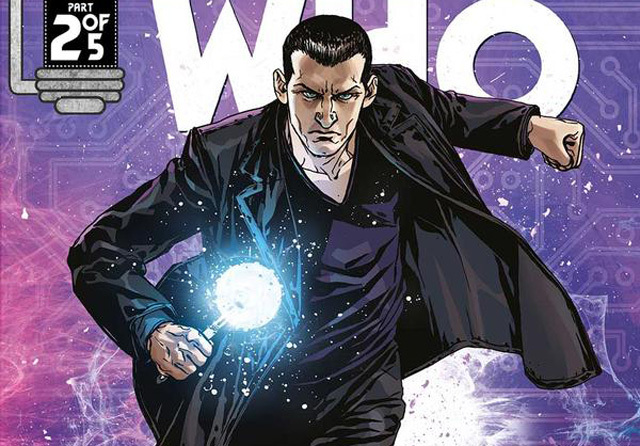 While the even-numbered New Doctors take the reins this time around, the Ninth Doctor is somewhat relegated to running, jumping and blowing up, while evoking the sound of his series by arguing loud and long with Jackie. That said, his section of this issue ends with both a mystery and a cliff-hanger, as things go kablooey in a really rather ‘what-the-hell’ way. Meanwhile, the boy in the bow-tie, while avoiding dinosaurs and what absolutely no-one is going to call Cyber-Reptilia (seriously chaps, Cylurians never occurred to you? ), discovers a piece of the puzzle that fits in with the discoveries that Twelve makes, establishing a kind of extended logic of looping timelines. In story terms then, while there’s a lot of expository dialogue and monologue in this issue, we do end up with an issue that advances the story and takes the shock and awe of issue #1 and explains it, lets it stand after two issues as ‘The Problem, in its complexity.’ How the various Doctors can work to deliver ‘The Solution’ over the course of the next three issues is something that we’re left hotly anticipating at the end of issue #2. Eleven’s pathway seems fairly clear, and Ten is not so much handed an opportunity as strapped into one and sent down the rollercoaster. The Ninth Doctor is not at home right now, he’s busy exploding, but it’s actually the Twelfth Doctor who’s best placed to deal with the problem at source – especially given the cliff-hanger to which he’s treated. A perfect issue of a multi-Doctor event comic then? The artwork here isn’t bad by any stretch of the imagination – there are some fantastic more theoretical or interpretative panels in this issue – the notion of the Cyberiad being housed in a giant Cyber-head in space is fun, though it must be a nightmare to upgrade every time they change faces, and some of the Sontaran work is great too, especially when notionally imagining some of the things the Tenth Doctor talks about. But where it falls down significantly is in two areas: the Doctors themselves and some of the background action. The Doctors themselves are drawn in a way that’s close, but deserves no cigars – in fact, the ‘nearly’ vibe of the Doctors becomes distracting relatively quickly, especially when you’re a long-term fan of Titan Who, because your mind immediately asks ‘Where’s Neil Edwards when you need him? Where’s Si Spurrier? Or Mariano Laclaustra? Or Rachael Stott?’ If you’re going to create an event-comic, and you’re going to recruit writers of Mann and Scott’s calibre to write it for you, it feels like a crying shame to leave the reader with the sense that it could have been better if the artwork had been less ‘nearly’ and more ‘really’ en pointe. Sadly then, that’s the feeling you’re left with after two issues, a kind of ‘Oh hellyes…but…if only…’ sense that the Cybermen were always due a storyline like this, but that the not-quite-rightness of the Doctor artwork, and the occasional vagueness of the background characters and architecture, doesn’t entirely do the story the justice it deserves. In essence, the issue suffers from the Timelash Curse – being a story far more interesting and layered than its budget allowed, that’s actually much better if you read it, and then re-imagine it in your mind, supplying visuals made from your own imagination, rather than the ones with which the story’s been matched for production. Cybermen have always deserved, a story where they win. It also poses fascinating questions about how you steal their supremacy from them in the remaining three issues. That’s quite enough to blow your mind. Just, for once, don’t expect this Titan to boggle your eyeballs into the bargain.